The first time I went snorkeling, the fish I wanted to find was Nemo. Walt Disney's movie has become so popular it excites me every time I see a colorful clownfish (or anemonefish) underwater. Nemo fortunately isn't hard to look for in the Philippines due to our tropical climate. Native to warm waters, this type of fish can be seen in reefs even as shallow as three feet. It's often swimming in or close to a sea anemone, its comfort zone. At times, it will loiter around to explore its surrounding environment. 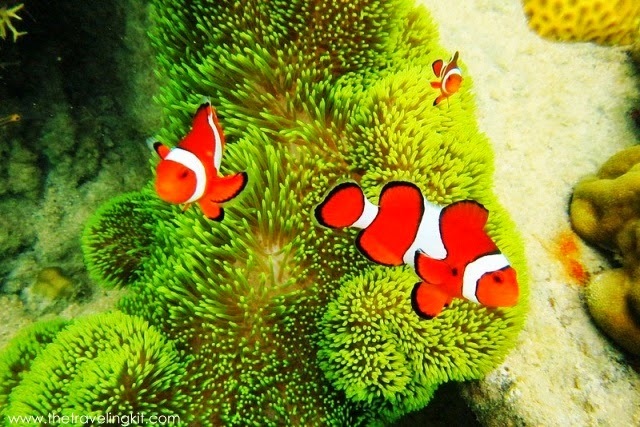 Here are some of the Nemo shots we've taken in Palawan, Samal and Negros Oriental. The first one was taken by Kuya Romi, our tour guide in Palawan. I would say that Nemo isn't the most awesome or amazing fish in the sea. What I like about it though is that it doesn't swim away if you dive closer to it. It will even look you in the eye and seemingly say "Hi!"